Hashiguchi Goyo (1880-1921)(橋口五葉) - Service information brochure "Japan to London and Antwerp"
Hashiguchi Goyo - Service Brochure for the NYK line, 1913, lithograph, very scarce. Hashiguchi Goyo (1880-1921) (橋口五葉) (real name; Hashiguchi Kiyoshi) - Service information brochure "Japan to London and Antwerp"
Service information brochure for the NYK Line route "Japan to London and Antwerp", published by NYK (Nippon Yusen Kaisha), Tokyo, 1913. 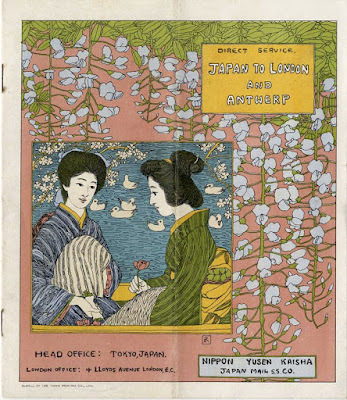 The front cover by Hashiguchi Goyo: depicting, in an inset with two bijin (Bijin - Beautiful woman or women) under flowering sakura (cherry) in front of a pond, the background is wisteria blossoms. The brochure gives the names of agents for NYK (Nippon Yusen Kaisha) in different countries. Conditions of passage. Distances between ports of call. Deck plans and so on. The front cover by Hashiguchi Goyo. Lithographed by pen and brush. Probably lithographed by Goyo himself. The work is not by a professional lithographer, at the same time the line shows brilliant artistic sense, which would indicate Goyo is responsible for the lithographing. One of Goyo's brothers were working for the NYK so it's understandable Goyo did quite a bit of design work for the NYK, such as brochures, postcards, menus and other ephemera. Most of the works unsigned but easily recognizable as the work of Goyo. Goyo also did a big amount of design work for Mitsukoshi – the department store, but here it's sometimes quite difficult to separate the unsigned work by Goyo from the works by Mitsukoshi's head designer Sugiura Hisui. In the brochure in the passenger tariff, we can find a first class ticket from London to Yokohama is £60, a second class ticket £41. Steerage class prices are not indicated as first and second class passenger was not expected to mix with steerage class passengers. Steerage class passengers information material would be very different from the present brochure. If you want to upgrade your first class ticket to cabin #31 (a lavish miniature suite and the best cabin on the boat) and you are traveling alone, you have to pay a 65% surcharge on your first class ticket. A "Round the World" ticket with NYK Lines would have cost you $ 510 (US Gold or Pound Sterling £102, in today's value about $12'000 (so you definitely got more "bang for the buck" in 1913) if you went via New York, if instead, you prefer to go via Montreal you would have saved US Gold $10. In 1913, the best and the rarest in ukiyo-e prints was about $400-500 (pristine Kaigetsudo prints and similar). Condition: Very good. The usual centerfold, short tear front cover right margin, center spread loosely on one staple, staples slightly rusty. Edition: 6000 copies. Today very scarce. This is the first copy of this brochure we have handled. Another example is published in Hashiguchi Goyo Ten (Exhibition of Hashiguchi Goyo), Odakyu, Tokyo, 1995, p.230, ill.360. Hashiguchi Goyo print exhibition catalog. Hashiguchi Goyo print depicting a beautiful woman, lithograph.